Place the packet mixes into a large bowl and make a well in the centre. Add the banana, oil and eggs and mix to combine. Divide the mixture between 2 lightly greased 20cm round cake tins lined with non-stick baking paper. Bake for 1 hour 15 minutes–1 hour 30 minutes or until cooked when tested with a skewer. Set aside in the tin to cool for 10–15 minutes before turning out onto a wire rack to cool completely. To make the cream cheese icing, place the cream cheese, ricotta, icing sugar, lemon juice and vanilla bean paste in a food processor and process, scraping the sides with a spatula, for 3 minutes or until smooth. Set aside until needed. To assemble the cake, trim the top of the cakes and discard. Halve each cake horizontally to make 4 even layers. 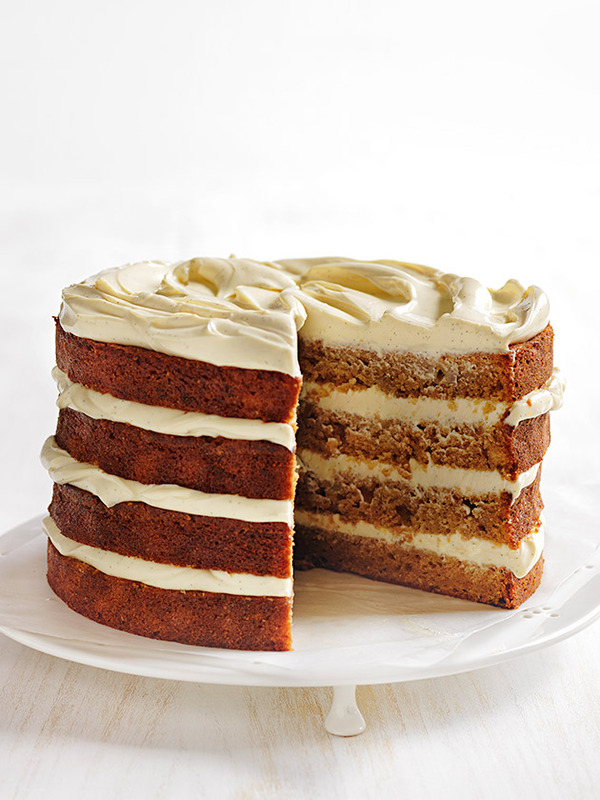 Place the bottom layer on a cake stand and, using a palette knife, spread with I cup of the icing. Repeat with the remaining cake layers and icing, finishing with a layer of icing. Serves 20–24.